A top plugin from a top producer, Butch Vig Vocals is a one-stop shop for rock and pop frequency and dynamics processing. One-knob control for many options. Precise filters. Useful saturation section. Novel interface design. Well positioned Focus parameters. No individual section bypasses. Signal flow not obvious from GUI. Each of Waves' Signature series plugins is designed to help you capture the essence of their eponymous producer or mix engineer's sound. Typically, the actual processors involved are hidden, with a more user-friendly interface providing 'macro'-style controls such as 'Bass', 'Treble', 'Compression' and so on. The latest signatory is über-producer Butch Vig (Nirvana, Garbage, Trent Reznor et al), and his addition to the range is a single plugin: Butch Vig Vocals (AU/VST/AAX/RTAS/TDM). With Vig renowned for his upfront production and edgy vocal sound, its not surprising that BVV incorporates saturation as one of its four core processes, the other three being filtering, EQ and dynamics. Notable by their absence are additive effects like reverb and delay, and any form of doubling - clearly, BVV's thrust is on tidying up, colouring and focussing vocals in order to sit them in the mix as easily as possible. "The Focus control really brings out those key vocal articulation frequencies, and we found it very useful indeed"
The unusual GUI has divided opinion on audio forums across the land. We find it attractive and very likeable, but it does little to indicate the actual signal flow. The order is: Input gain (+/-24dB), filters (adjustable LoCut and HiCut) and MidDip, De-Esser, Compress, then EQ (Lows, Presence and Air). The signal is then split into three parallel paths - Dry, Saturation and Focus - which are blended back at the Output gain control (+/-24 dB). The Saturation section is paralleled further with Tube and Solid State options, and its own filters (HiCut and LoCut again). There's a definite 'black box' angle to all the Signature plugins, with a stripped-back control set that governs the actions of a more complex under-the-hood setup. This is particularly evident here with the De-Esser and Compress processors, whose one-knob designs (and the De-Esser's fixed 6kHz frequency) boil everything down to simple 'more/less' operation. Even so, the compressor still covers lots of ground, from gentle to quite harsh, and we understand that it's inspired by the Summit TLA-100 and Urei 1176. Elsewhere, in contrast, the controls are quite specific. The first LoCut and HiCut filters cover a wide frequency range (17Hz-1kHz and 21-1.2kHz, respectively) and - although roll-off slopes aren't quoted - are reasonably steep (we measured 18dB/octave). Meanwhile, the MidDip control delivers a fixed -6.5dB bell-shaped cut anywhere from 301Hz-1kHz. We appreciate that Waves are going for an easy-to-use notch function here, but it would benefit from adjustable cut amount and bandwidth. The main EQ, on the other hand, despite its fixed frequencies and bandwidth, actually delivers useful broad peaking EQ (+/-10dB) at 300Hz, 3kHz and 15kHz. The Saturation section can generate plenty of harmonics, and only a little is required unless you're really going for it, while the Focus control offers a broad, fixed-gain mid-range boost centred on 1kHz or 2kHz. This really brings out those key vocal articulation frequencies, and we found it very useful indeed. 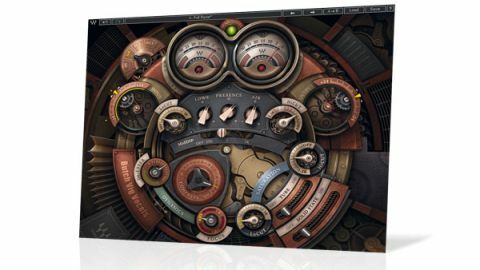 Butch Vig Vocals' focused feature set makes it a welcome and worthy addition to Waves' signature plugins roster. If you're a fan of Vig and his particular sound, this shrewdly realised toolbox will serve you well, even though you'll need to turn to other plugins for the effects and spaces required to really complete your vocal sound.